US ▼ 2010-09-15 800pts ? (Trial Game) 2010-09-15 FREE ? UK ▼ 2010-09-15 800pts ? EU ▼ 2010-09-15 800pts ? DE ▼ 2010-09-15 800pts ? JP ▼ 2010-09-29 800pts ? AU ▼ 2010-09-15 800pts ? KR ▼ 201x pts ? (Pyeong-gapan Game) 2010-09-29 FREE ? Sonic Adventure is a downloadable version of Sonic Adventure and Sonic Adventure DX: Director's Cut for Xbox 360's Xbox Live Arcade, Sony's PlayStation Network, and the PC Steam client. It is a port of the PC port of Sonic Adventure DX: Director's Cut and contains most of the changes found in that game. 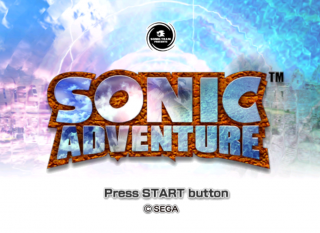 While the game is a port of the DX version the title screen and menus are that of the original Sonic Adventure. The screen size is also not full screen on a HDTV, instead it has a 4:3 ratio. Downloadable Content is available that will "change the game to DX". This means changing the menus, adding missions to complete, and a Metal Sonic skin for Sonic. The game comes with 12 achievements but the DLC adds 3 more. Unfortunately the DLC does not add the Game Gear games. Support for leaderboards and dual stick camera control is added. The Xbox live version supports the 360 Chatpad when naming Chao and custom soundtracks. The game costs 800 Microsoft points on Xbox Live or 9.99 on PlayStation Network. The Sonic Adventure DX Download content is 400 Microsoft points on Xbox Live or 4.99 on PSN. The Synopsis/Characters, Story Structure, and Gameplay are all exactly like the original game. The update doesn't appear to have fixed any of the bugs compared to the 2004 version, but it did break installations where the main executable was replaced with the SADX 2004 executable. 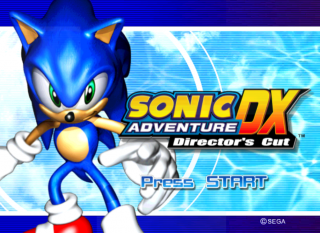 Adds content from Sonic Adventure DX: Director's Cut. This page was last edited on 8 April 2019, at 15:57.